Yes, how I miss, as do thousands and thousands of other folks who knew it. Spag’s was one of a kind. Impossible for anyone to replicate it. And what a sad and tragic ending it had. I knew it at its greatest. And just saw it. Closed, Empty. Dead! Just a pitiful ghost of the great and unique and hugely successful store it was. 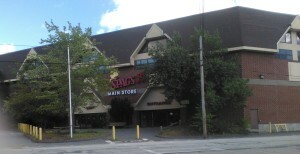 Spag’s grand signature store near the end. But a huge change had taken place. Look at the sign. It was no longer Spag’s. It had become Spag’s 19! It was in Worcester, Massachusetts. Well, just across Lake Quinsigamond in Shrewsbury at 193 Boston Turnpike. Maybe you knew Spag’s. So many people all over the U.S. got to know it. If you were a visitor or tourist and heard about it, for sure you’d go take a look. And you’d buy and buy. And go home with grand stories to tell about it. It was a discount store. One-of-a-kind. Quality merchandise at the most reasonable prices imaginable. In fact, a department store. Stocking just about anything and everything you might need for your home plus things for your office or business. It was my Number One go-to store all the time I lived there. I’d bet that it was the favorite store of thousands of folks in that whole metropolitan area. I’d even bet it was the most successful store the Worcester area ever had till then. It was called Spag’s because that was the nickname of its amazing founder, Antonio Borgatti. He loved spaghetti! Everybody called him Spag–the mayor, the governor, even people who came in with only a dollar or two, or teenagers just looking. Spag got off to a fast start. Right after graduating from Shrewsbury High, with $34 borrowed from his Mom, , he opened a sidewalk stand. He sold odds and ends.. Right there, where he was destined to become the best known retailer around. He started attracting customers. Felt so encouraged that he rented the store right there and started expanding. And never stopped. Tacking on one addition to the building, then another. That went on close to 50 years. As a culmination, he built the big, grand, handsome building that became his signature building. I saw it as a monument to himself for the hugely successful business he had built up. By that time he was taking in multi-millions every year and flying around the country in his own big private plane on business deals. And would you believe? With his wife Olive at the controls! His lifelong sidekick. “Mrs. Spag.” In fact, she was listed as the president of Spag’s, He was the treasurer. He set it up that way. This shows Spag’s as its golden age opened. It would expand and expand and become a sensational store. There was more to Spag’s store than just this long string of a building. On this side and that side, as he got the opportunity, he bought one building after another and used them to expand. Four or five of them. One for this line of goods, and one for that. Or he’d raze them the huge parking lots he needed. Result: Spag’s became a big complex, a whole neighborhood unto itself. Yes, a very savvy businessman he was. Here’s just one example. When he started getting bigger, he would buy a whole trailerful of paint, say. Or paper towels and toilet paper. Or plumbing stuff. To the very end, inside the store, he ran it with his goods piled high. Narrow aisles. And to say it again, everything for sure was of high quality and everything a bargain. You know, I thought “no bags” was a big mistake. Here’s why.You might buy lots of things. Could not carry them all. Might tuck smaller items in your pockets. Might inadvertently go through check-out without thinking of them. I admit that a couple of times I walked out without paying for little things because I forgot them in my pocket. For sure I’d make good on that the next time. For sure that happened to many folks. Of course, I’m sure some people stole that way. The man himself, big smile, big heart, big in so many ways. What marketing stunts Spag would pull. The most successful was his tomato plant stunt. Every spring he would give away bundles of 25 tomato seedlings. Absolutely free .Even if you walked out without buying a thing. He would give out thousands of them. People would stand in line for them. I would stand in line for them. He’d announce the giveaway in the newspaper. Then they’d show up by the hundreds. People got to love not only the store but Spag the man. With reason. He ran such a wonderful store. And he was such a good man. Tales about him would make the rounds. The time he spotted a 12 or 13-year-old boy looking at a toy. What kind I don’t remember. $30. An impossible dream. Spag happened to notice him. He picked up the toy and said, “Know what? I ordered too many of these. If you want it, you can have it for three dollars. Okay?” The boy snapped it up in a second. Or the time a security guard caught a man stealing a pair of boots. Notified Spag. Spag came and spoke to the man. A family man. Hard up. Spag gave him the boots. Plus clothes and toys for his kids, it was said. How, when somebody died in Shrewsbury , Spag would send off munchies for after the funeral. If someone in town had a fire, same generous gesture. And these weren’t isolated incidents. Here’s the store that I beheld. Empty. Grim. Forlorn. Dead! So, so sad. I never imagined such an end. I remember that back when I was the magazine editor at the Worcester Sunday Telegram, for one issue I decided we should publish a thorough profile of this remarkable Antony Borgatti and I sent off a writer and photographer to do it. They did a great jog. It was a big hit. A few years later, when I was director of public affairs at Assumption College, which is in Worcester, as you know, I had to plan a “burning of the mortgage” ceremony for our best-known building, La Maison Francaise (The French House). Important ceremony. I wanted a dramatic touch as part of it and needed a gold shovel. Just take my word for it. Where to find a gold shovel? Spag’s! Sure enough he had one. And it was a bargain. 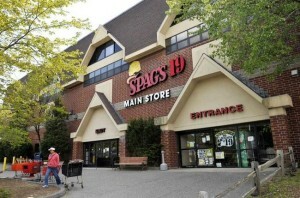 For years I went to Spag’s weekly. At least. While I was building our home in Auburn, Again after I started buying residential properties as a sideline business. Taken minutes later. You can see the long string of stores Spag’s became as it grew. Out of sight are its half dozen free-standing stores. All empty. I didn’t know a thing about sailing. Had never been in a sailboat. That pamphlet was the clincher. I learned. I had fun. I moved up to other boats. It was all Spag’s fault. One time I decided our Arthur and Monique, in their early teens, and our younger Mark positively had to learn to type. An essential skill. No course offered at their school. At Spag’s I bought three Smith Corona portables. $39.95 each, I believe. And a typing course consisting of a textbook and four phonograph records. $14.95, I think it was. 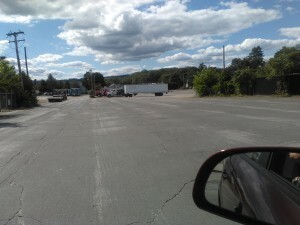 The lot where scores of trailers of “inventory” were lined up in row after row. Only one left–no idea why. Nearby were the store’s huge parking lots. Also totally empty now. They had just started summer vacation. For an hour every morning Monday through Friday they sat at the dining room table, their fingers on their keyboards, the phonograph turned on telling them what to type, and they typed, typed, typed. That did the trick. So what happened toward the end? Spag tried to keep up. Certainly he made concessions. Gave out bags! Opened on Sundays. Made shopping carts available. Plus others. But many big changes around him were bringing intense competition. Big specialty stores began popping up. Home Depot. Staples. Others like that. People enjoyed having such big stores closer to home, fancier stores. Who knows? Many customers drifted away. Well, Spag died. His years among us, by the way, were 1916-1996. He had three daughters and they took over. They tried hard. They even launched a Spag store in Springfield. It failed. Their only solution—to find a buyer. Jerry Ellis and his partner (can’t remember his name) made an offer and took it over. They had been a retail phenomenon of their own with their Building 19 chain. Some nine or ten stores. So called because that was the address of their first store, located in an industrial complex. They sold overstocked merchandise, close-outs, railroad salvage, all kinds of stuff they coud pick up cheap. I enjoyed Building 19, too. Lots of fun. Ellis–a colorful character in his own right– was an admirer of Spag and I’ve heard that’s what drove them to spring for it. They changed the name to Spag’s 19. It didn’t fly. That was it. The great Spag’s superstore died. By then it was so changed you could hardly recognize it. A sad day. I visited Worcester last week and went and took a look for old times’ sake. My first in some years. I knew it had closed. But! A ghost town! 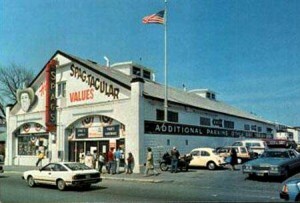 That’s what the sprawling Spag’s complex had become. Not a soul around. Every one of the buildings was locked up tight. They looked worn, in need of repairs, forlorn. Those vast parking lots now totally empty. Weeds growing up through cracks in the blacktop. Every one of those many storage trailers gone. I had not expected so bad. It depressed me. Ruined my day. And then I thought, Thank God Spag did not live to see this! He would weep and weep. 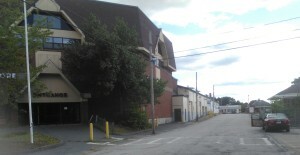 Suggestions and proposals have been made for the property. Maybe a supermarket. Maybe something else. I don’t know. Whatever it is, however good it is, it will never equal Spag’s. What I am grateful for are all my enjoyable shopping there, and all the terrific memories. And getting to know the extraordinary man with such humble beginnings who liked spaghetti and sported a 10-gallon hat and had the amazing genius to make it all happen. What a wonder!